Now that you’ve seen how I decorated the rest of my apartment, it’s time to share the most exciting addition to my new place: my closet! Lisa Adams of LA Closet Design did an amazing job re-doing this space and turning it into a sartorial sanctuary. 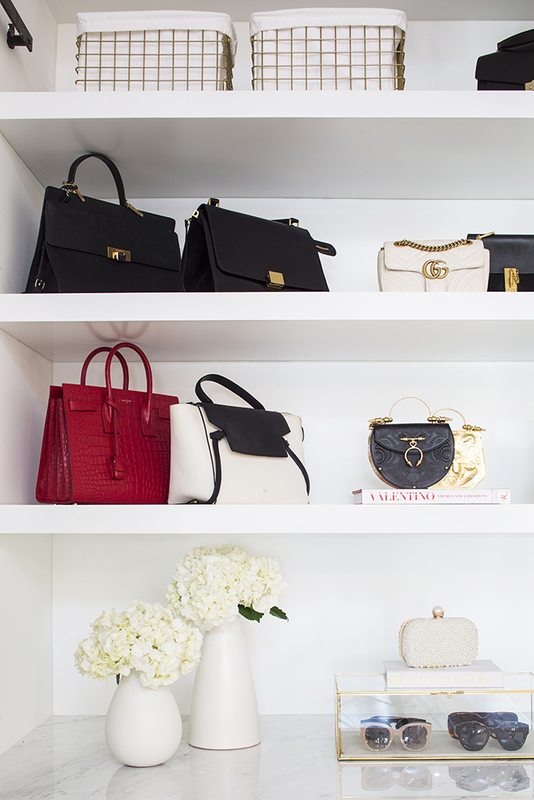 Keep reading to learn more about my closet redesign and pick up some tips for your own home! You know what they say: out of sight, out of mind! To combat forgetting about pieces in your closet, I recommend keeping your accessories on display so you can always consider all your options when dressing up an outfit. Flat, clear boxes are a great way to display sunglasses, and I always place my handbags on open shelves. Mirrored shelves and drawers help to expand a small space. Plus, the more angles with which to admire your outfit! Your closet should be an oasis. Add homey touches like coffee table books, candles, and flowers to spruce up your shelves and drawers. I also added an ottoman and soft furry rug so I can lounge and have a place to comfortably put on my shoes.